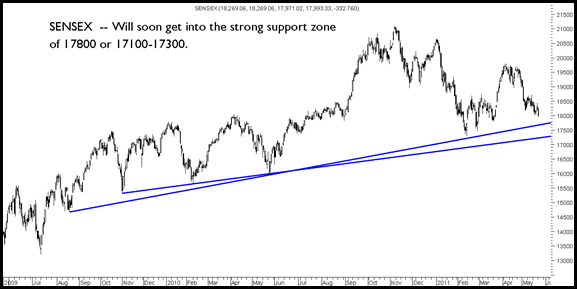 Sensex will soon near an interesting investment zone 17800 or 17100-17300. Smartlink does a first rewards with 30 + 2 rs dividend. The postings would be on a stop in the end of the week mostly as have an important family function 🙂 but finally after quite some time Sensex if dips more around 17300-17100 would be an excellent investment zone. Atlhough short term support at 17800. - > The long term channel comes around 17100-17300 and 17800 zone. We may watch for turnaround signals closer to that area. - > In the short term last bottom around 17792 and a channel line at 17800 should provide strong support. - > In the fall RSI has been showing positive divergences so it does not suggest strong bear momentum and pullbacks would be quick and shortlived till we dont see follow up buying. - > In the short term the next quarter may see inventory losses but the change in net operating margins may offset it by some margins and will depend on different companies. - > As per my statistical look into Inflation the base effect will start creeping in after June-July as well as the effect of RBI hikes will be seen. We may have seen the peak of inflation and post July the base effect will temper down inflation and if monsoons end up well it could be a double effect and i dont expect any further petrol rate hikes maybe 2 rs on diesel. All in all as i have been maintaining the view since quite some time Post June could be better times for the market. Technically also a similar implication :). After taking the call to go on High cash at 19900/19000 break have started now advising clients to start buying as well as deploy fresh money. The company declared a special dividend of 30 rs and a regular dividend of 2 rs which clearly shows the intent of the management as majority of the companies with such business sellout have not rewarded shareholders and are quoting at 40-50% discount to cash on books. With the above action of the management the faith increases although in the short term the stock can again go higher to 100 + levels but with a cash per share of almost 150 it would be an interesting long term buy if drops sharply in the future. On the same lines of cash on books would be looking at Piramal Healthcare at 300-350 and Riddhi Siddhi Gluco at 300-270 which give a good margin of safety in comparison to possible rewards. Is it money at discount? there is one more such stock ie kanoria chemicals which has sold its chemical bus to Aditya Birla group for 800 crs on 23rd kindly have a look . Right now it is locked in uc. Is MIC Electronics a good pick around Rs.18? 17800 se u turn hogaya kidar ho bhai? ab tho fresh levels batao:-) family function se time nikalo aur hindustan ke janta ke baare mei socho ab! Will get back with a detailed post tomorrow. can u give an idea on ucal fuel?? it surged by arnd 15-16% today with good volumes. can it show 98-102 levels?? 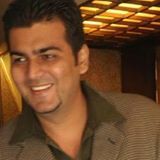 good day nooreshbhai , good wishes for ur sisters weddin. How is Ganesh Housing for a buy at 121?